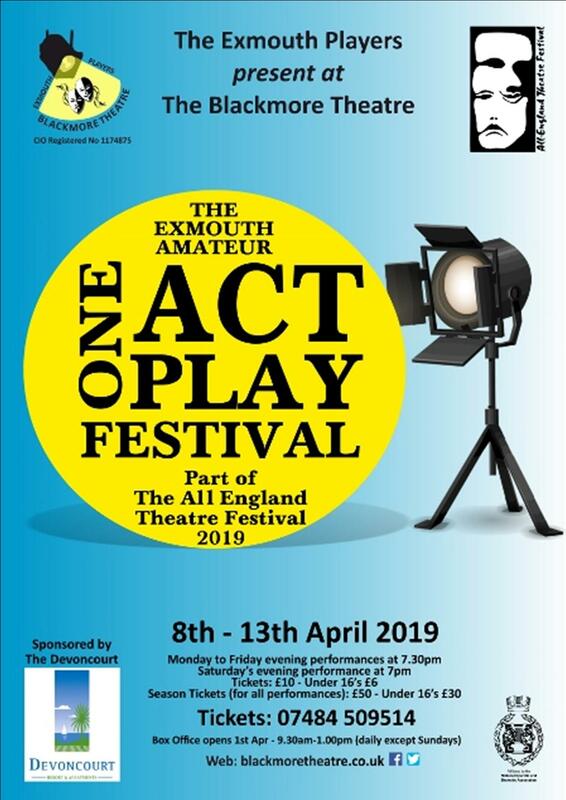 The Exmouth Players present the 40th Exmouth Amateur Festival of One Act Plays as part of The All England Theatre Festival 2019 (Western Division) at The Blackmore Theatre, Bicton Street, Exmouth from 8th – 13th April 2019. This year’s Festival is sponsored by The Devoncourt Resort (Exmouth). Evening performances on 8th to 12th April at 7.30pm & the final performances on 13th April at 7pm. This is an opportunity for those drama groups who have entered the 2019 Festival to perform their One Act Plays in front of a professional adjudicator. There are various cups and trophies awarded for best performance, best actor, youth performances, best original script and so on. Only Season Ticket holders attending all the performances throughout the week will be able to vote on who they think should receive the awards in most of the various categories. At the end of the awards ceremony on the 13th, the Adjudicator will announce the winner and runner-up drama groups who have elected to go through to the regional Quarter-Finals with their plays in this year’s All England Theatre Festival. TICKETS Adults: £10 (per evening) – Season Tickets (for all 12 plays) £50 Under 16’s: £6 – Season Tickets £30 Tickets on sale from 9.30am on Monday 25th March 2019 by calling the Ticket Line 07484 509514, only. Theatre Box Office opens daily from Monday 1st April between the hours of 9.30am and 1.00pm (except Sundays).